Visiting the marvellous Modhera Sun Temple of Mehsana, Gujarat, is sure to leave your heart with a duality of thoughts. It's a mixed feeling of both surprise and anguish. The precision of this jaw-dropping structure of Modhera and the hard work of the thousands behind it is going to leave your mind surprised. And it'll also leave you anguished when you realise that all these majesties were plundered with one stroke of destruction by Mahmud Ghazni. Standing at this moment, the temple of Modhera is just another magnificent ruin; an enigma that is lost in time. Built on the bank of Pushpavati river, the Modhera Sun Temple, today, stands as an obsolete temple where no worship is offered anymore. And you'll be shocked to know that this extraordinary piece of art was crafted even before the Konark Temple of Orissa. So in case are planning to travel across Gujarat, don't forget to add this to your itinerary. Reasons, you ask? Here you go! To begin with, the whole temple is pillared on a lotus-shaped structure and every inch of its walls showcase edgy, detailed carvings. And those carvings represent every bit of our culture: from Ramayana to Mahabharata, from the human lifecycle to Kamasutra. And the entire temple is expertly divided into three segments. The Surya Kund, which is a deep, stepped tank right in the front of the temple, was earlier used to store pure water. Although there is nothing more than accumulated rainwater presently, it is believed that earlier there used to be an underground spring. The assembly halls or sabha mandapa used to be the place for religious gatherings and conferences. Essentially built for the pilgrims, this place even had slabs constructed along the walls for them to sit and rest. Finally, you can reach guda mandap or the sanctum sanctorum by crossing the passage with pillars and arches. Once, this hall used to bear the idol of the Sun God before being plundered by Mahmud Ghazni. Still one can see the twelve different facets (for each month) of the Sun God on its walls. Mythologically speaking, the walk from the kund to guda mandap via the main temple is observed as the transcending journey from death to moksha. It's mesmerising. The Modhera Temple was constructed under the reign of King Bhima I of the Chalukya dynasty. Created back in the early 11th century, Modhera has literally been mentioned on the history pages of Skanda & Brahma Puran. Even mythologically, Modhera and its surrounding areas have been referred to as Dharmaranya or the forest of righteousness. On top of that, this place was also blessed by Lord Rama. At present, the temple is undertaken by the Archaeological Survey of India for renovation and restoration. In 2014, this Modhera Sun Temple was added to the list of UNESCO World Heritage Sites. Modhera Temple and its dedication to the Sun God will leave you stunned. - The temple was so constructed that during every equinox, the first sunrays would fall on a diamond placed on the Sun God's head. And the entire temple would illuminate in a golden glow. - On other days, two pillars before the garbhagriha would stay illuminated throughout the day, regardless of the position of the sun. - the sabha mandap still stands on 52 pillars, depicting the 52 weeks in a year. - carvings of the sun, along with its unity with the other 4 elements-air, water, earth and space- can be spotted on the walls. By Air: You can fly to the nearest city to Modhera-Ahmedabad-from where regular government bus services are available. By Train: For the ones boarding a train instead, the nearest railway station is at Mehsana-25 km from Modhera. 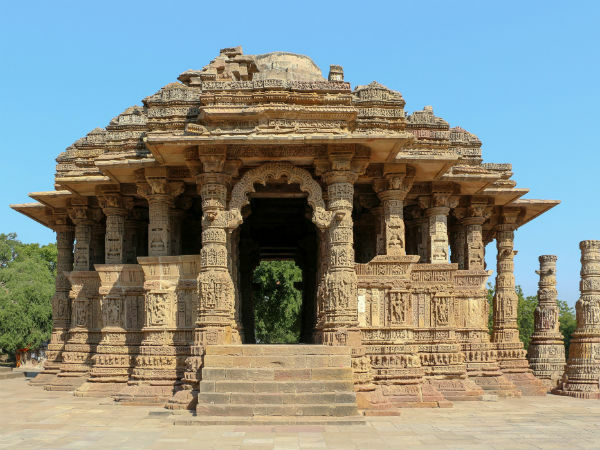 By Road: Modhera Sun Temple can be easily reached by boarding a bus or hiring a taxi from anywhere in Gujarat. The Modhera Sun Temple indeed leaves you awestruck. It is one place, amidst all the ruins, where you'll find a perfect blend of ageless creativity and tremendous hard work.